In a recent conversation with my good friend Prog Al Peterson, the subject of progs nice people came up and those of whom we have met. I immediately recalled a Greenslade gig at The Newcastle Upon Tyne Opera House where after an amazing and intimate gig in the Bistro I managed to chat with the band. Whilst it was a thrill to meet the legendary Mr Greenslade and the ubiquitous Tony Reeves, it was the enthusiasm and enchanting nature of John Young that enthralled us both. Having played a blinding set John shared a couple of beers with us both and talked about all things music. It was this memory that prompted me to contact John recently and fired a few questions his way. Needless to say that John along with a few other down to Earth people has been firmly placed in the nice category and is a man with whom it is a pleasure to communicate. PM Hi John, Many thanks for taking time out to be interviewed by The Progmiester. I have no doubt that you have been asked some of the questions many times before. I crave your patience. Can you tell me a little about your musical background? JY I started learning the piano at the age of 5 and singing in the Liverpool Cathedral choir from the age of 7. I received the Rushworth prize for my piano playing when I was 11 years old and went on to become head chorister at the Cathedral. PM Who or what would you say were your biggest influences when you were at this tender stage and learning to play? JY I think as a child my biggest influence tuition wise were Philip and Terry Duffy at the Cathedral as they understood my thirst for all things musical. Piano wise I loved the romantics Schumann, Debussy, Rachmaninoff etc. As I moved into keyboards I liked the playing of Patrick Moraz and Rick Van Der Linden as they seemed to play music in a similar vein and not mathematical as many players do. PM When did you start playing music for a living? JY 1985 really, I signed up for a world tour with Uli Jon Roth and I guess that changed my life….nothing was ever quite the same. PM What made you become interested in Progressive Rock music? JY I think my classical upbringing in St Edwards. I did grade viii and A level music so prog seemed like the next step. It was just a shame that it was eclipsed by other genres so soon. PM At what point did you start playing in a more progressive style or indeed prog rock? JY I think from the word go, I bought a Diamond 700 organ and a vox piano and I was off….that said, I played purely classically and it took a while for jazz, blues and other influences to play their part. As such I only became happy with my own writing towards the end of the 90’s. PM Tell me more about the early forays into prog rock, bands etc? JY Well, I was in involved in some local bands in Liverpool, Cloud (cool name huh! ), Solitude, and Lynx and then the jazz combo. England’s National Sport (a real favorite of mine). I spent a couple of years with a band called England in the early eighties. After Uli I returned to prog a few years later with Cathedral another favorite with (with Jon Camp from Renaissance) and then with Asia in 1989/90. Further prog occurred with John Wetton and Qango in the 90’s and then Greenslade around 2000. PM Who would you say was or is your biggest influences in prog? JY Moraz, Yes, Focus, Genesis, Trace, Refugee, Gentle Giant, Alan Parsons, Peter Gabriel etc. PM From where do you draw inspiration whilst writing new material? JY Well it used to come from my experiences and such like….now it all just comes from somewhere else…I don’t ask questions! PM How did you become involved with Greenslade? JY I think a promoter recommended me to them and we hit it off straight away. PM Did you enjoy the gigs with Greenslade? PM Did you like the early Greenslade albums? JY To be honest like most folk I only really knew the artwork…but once I started getting into it I thoroughly enjoyed it. I can understand if it is an acquired taste…but that said I certainly acquired it. PM Tell me about Qango, how did that project come about? JY I wasn’t involved to start with, I just got a call from John Wetton saying that their first choice of keyboard player couldn’t do it and would I take over. PM Who was the first choice of keyboard player? JY Not sure who the first planned keyboard player was I’m afraid. PM What has been the highlights of your musical career so far? JY Oh loads really. I think the first tour with Uli took some beating. It was great to work with Asia as I had the albums 😉 Writing with John Wetton and Jon Anderson has been fun. Playing the Pyramids with The Scorpions, my solo tours in the USA with my knapsack on my back!…the list goes on and on. PM Has there been any low points? PM Can you tell me about the company that you set up making musical instruments? Is it still trading etc? JY Well that would probably take a small book but in a nutshell I started buying and selling from my bedroom and a few other folks joined me. I bought a bigger house then eventually we got 2 suites of offices and at our height I employed about 15 people (including my ex bank manager). We started manufacturing synthesizers in the early nineties and at our peak we turned over £1.5 million. We even sold synths to Japan. As we became more normal and corporate I lost interest and a few years later when I was going through some personal turmoil some so called “friends” pushed me out of the business (but made sure I kept all the depts.! )….It was not a particularly pleasant chapter but the early years were a lot of fun. PM That’s amazing; tell me more about the synths? How did you get into that? Were they analogue or digital? I’m intrigued. JY Well, it’s not that amazing Steve but it was fun. I just started buying old analogue stuff, Roland’s, Prophet’s, Moog’s, ARP’s etc and selling them on. This got quite profitable and soon I had some folks working with me who could fix them too. The synths were popular with old prog type bands (who we also bought from) and the new emerging dance acts. We realised that there was niche market for TB303 clone (dance bass lines) so we invented the Deep Bass Nine synth and sold about 2000 of them. It was my company so I kind of made the nuts and bolts happen but the technical side of things was dealt with by my R&D team as I’m a bit useless on that side of things. Earlier in life when I was 23 I was European sales manager for an American air freight company at Heathrow airport so I’ve always been able to sell stuff so I just applied that the equipment side of things. It was great until the gloss wore off and it started getting a bit too corporate. I might re-emerge soon as I have a website idea that seems to be growing in strength. I’m just looking for a web-designer to come in with me on it…so if you know anyone who might be interested let me know. PM Are there any musicians with whom you have not yet played with who you would like to? JY I’d quite like to work with the guys from Yes and Genesis but I guess as we all get older that becomes less likely. PM Which would you say is your most memorable gig? JY I think it’s unfair to single out any one particular gig…they can be memorable for so many different reasons. The Pyramids was pretty surreal and playing to 200,000 folk in Austria was great but that said probably one of the best gigs I’ve done in my life was to 11 people at Fat Lil’s in Witney with my own band a couple of months ago. It’s the closest I’ve ever come to flying on stage. PM Ultimately and given the resources, what would you most like to achieve in your musical career? JY Simple….I’d like to be heard. PM Do you mean metaphorically? JY It’s quite literally really…Radio doesn’t play my music and of course tv is very unlikely. You won’t hear about us in the media and venues only want covers and tribute bands so getting the word out on new original material has never been more difficult, or at least that’s how it seems. We are still playing music from the live 2003 tour and most people who show up at a concert have never heard any of it before. It’s all a little odd. PM Maddening isn’t it? Which brings me nicely onto your views on the present music industry. What are your views about the current download culture? Should we embrace or despise? JY I think we have no choice but to embrace. That isn’t so much the problem; it’s much more endemic than that. It’s rooted in giving people the lowest common denominator in music and telling them that is100% of their choice, it’s disgusting. A great quote I saw on myspace said I’m eclectic, I like from Robbie to Kylie. PM Dessert island discs? Take a moment John, what’s your top ten? PM Who or what are you listening to at the moment? JY I don’t really get the chance sadly. PM Do you have any new projects in the pipeline? JY Yes although I can’t tell you anything much at least until things are firmed up a little more. I plan to release some contemplative material in singer songwriter vein, some rockier tunes for the John Young Band and a project….. That’s really all I can say for now. PM Any gigs planned and with whom? JY Yes, I’m still touring with Bonnie Tyler and I’ll be out solo and with my babd in the months to come. I may be working with several other artists too. PM Will you be attending the forthcoming High Voltage Festival in London ? JY Sadly I’m gigging in Germany. PM John many thanks for sharing your past present and future. JY you are most welcome…It’s been a pleasure. 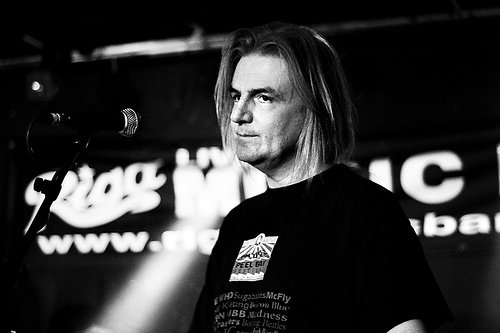 Please check out John’s Myspace for gigs and other news. I would strongly recommend giving John a hearing should he be in a town near you. Better still treat yourself to one of his album.